More than 50 golfers braved the elements to raise funds for ellenor, Kent’s only charity offering hospice at home care to children, at the inaugural Larrytech Charity Golf Day. ​A record 609 people took part in hospice charity ellenor’s Twilight Walk on Friday night in Gravesend – truly turning the streets of the town orange for an evening! 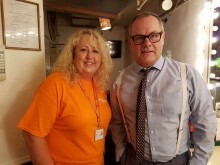 ​Some of the top comedians in the business took part in a fantastic evening of comedy at The Comedy Store in London on Monday 5 September and raised £4524.82 – through ticket sales and a bucket collection. ellenor Patron, Tom Parker from The Wanted and his fiancée, Kelsey Hardwick, are to take part in the charity’s flagship fundraiser – the Twilight Walk – for the second year running. 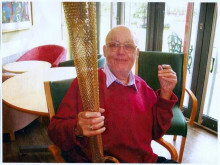 This year, the couple are bringing some friends to enjoy the walk’s unique atmosphere of memories and smiles. 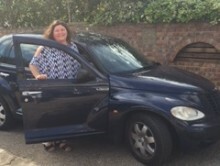 ellenor Patron, Cheryl Fergison (AKA Heather from Eastenders) is selling her beloved car ‘Dolly’ and is listing it on Ebay on September 10 – with a quarter of the proceeds coming to ellenor to help support families facing terminal illness. ellenor – which has been chosen as one of the charities to be supported at the forthcoming global BGC Charity Day – was on The Pantiles this week promoting its involvement. 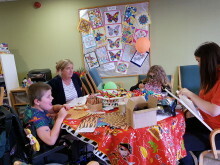 Young patients supported by ellenor Children’s Hospice Care enjoyed a fun and friendly Family Drop In session at The New Beacon school in Sevenoaks on Wednesday 24 August, which was kindly arranged by one of the charity’s Ambassadors, Gill Chadbon. 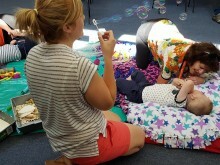 The children which ellenor supports 365 days a year came along to ellenor Gravesend on Friday 19 August for a fabulous Family Fun Day. 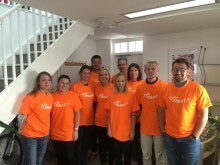 Tunbridge Wells-based HR Revolution – the outsourced HR solutions provider – has teamed up with NDK Consulting, a technology and cyber security recruitment business, to take part in the Bewl Water Dragon Boat Race on Saturday 10 September. ​The Tunbridge Wells-based law firm, CooperBurnett, has raised an incredible £15,676.41 for hospice charity ellenor over the past 12 months – smashing the original target it set of £10,000. ellenor has been chosen as one of only a very few local charities nationally to be hand selected to take part in and benefit from the BGC Charity Day 2016. ​Zac Bennett is 12 and lives in Maidstone with his parents, Caroline Baker and Lee Bennett, and his younger sisters Olivia (aged 9) and Ruby (aged 5). 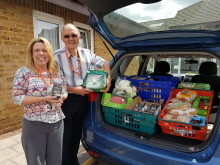 Marks & Spencer (M&S) Bluewater has launched a food donation scheme for ellenor, the local hospice charity which supports families facing terminal illness. Any food which cannot be sold to customers, but is still fit for use, is being donated to the kitchen at ellenor Gravesend. 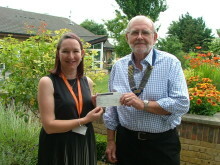 Colin McRobert, President of Swanley and North Downs Lions, visited ellenor Gravesend recently to present the charity’s Chief Executive, Claire Cardy, with a cheque for £6000 – an amount which could pay for a typical patient stay on the inpatient ward at ellenor Gravesend. 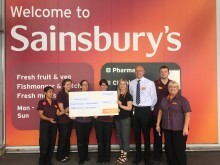 ​The Sainsbury’s store in Crayford recently presented ellenor with a cheque for £7365.11 – raised from supporting the hospice charity for the past 12 months.